The best way to learn more about Laurel is by scheduling time to visit. 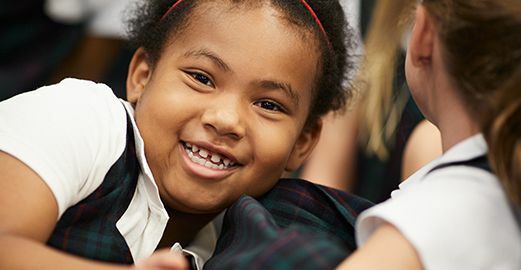 Meeting teachers and students, seeing classrooms in action and walking through the halls will help you discover why Laurel is the private school that knows girls best. Parents visiting Laurel School will tour their desired school level with a member of the Admissions Office, which provides an opportunity to meet our phenomenal faculty, learn about curriculum, as well as observe the dynamic, engaging and lively classrooms. The tour allows us to answer your specific questions and get to know your family. We also invite families to spend time touring with one of our Green Key tour guides. This allows you to hear about Laurel from a current student – many of whom have been here since their Pre-Primary or Primary School years. After touring, you will learn more about the admissions process and next steps. A screening is required as part of the Pre-Primary School application for Preschool, Prekindergarten and Outdoor Pre-Primary candidates. Prospective Preschool and Prekindergarten students and their parents are encouraged to complete their screening at one of our screening dates listed to the right. Screenings are informal and offer prospective students and their parents a glimpse at the hands-on and age-appropriate fun they can expect at our other campus. Please contact the Admissions Office at 216-464-0946 or Admissions@LaurelSchool.org to schedule an individual screening. A Kindergarten Visitation Day is required as part of the application to Laurel’s Kindergarten. Please plan to join us for one of two visitation days where girls will join our team of Kindergarten teachers to engage in interactive and interdisciplinary activities. Parents will hear from Head of School Ann V. Klotz, meet current parents and learn about the exciting things that await your daughter in Laurel’s Kindergarten. Space is limited. Please RSVP to one of our Kindergarten Visitation Days listed to the right. Students entering Kindergarten are required to complete an academic screening to assess Kindergarten readiness. Screenings are completed one-on-one with one of Laurel’s Learning Enhancement Specialists and results will be shared with parents. Screenings are conducted during the visitation days, or, you may call the Admissions Office at 216-464-0946 to schedule an individual screening assessment. Students visiting First - Fourth Grade at Laurel will spend the day with their peers participating in different classroom activities. Our student visitors are paired with a classroom hostess, whom they will shadow throughout the school day, including recess, lunch (which Laurel will provide) and specials. During the student’s visit, she will meet with one of Laurel’s Learning Enhancement Specialists to complete an academic screening in the areas of math, reading and spelling. Screenings are completed one-on-one and results will be shared with parents. Students visiting Laurel’s Middle and Upper Schools will spend the day with a current Laurel student. Girls are paired up based on their academic and extracurricular interests. Visitors will also go on a tour of the building with a Green Key student tour guide. At the end of the day each visitor will interview with an admissions office director. This gives the student a chance to ask any additional questions and allows us to get to know each visitor better. We will provide lunch and a notebook for the day. For the 2018-19 school year, prospective Upper School students are welcome to visit on most Mondays, Thursdays and Fridays. These visits will begin October 2, 2018. Please contact the Admissions Office to schedule this experience. Though Laurel School students wear uniforms, we encourage our visitors to wear anything they are comfortable in with the exception of jeans or leggings. First through Fourth Grade students who are visiting for the entire school day may go outside for recess after lunch, weather permitting. Please bring the appropriate clothing to go outside. The main entrance of the school is marked by a flagpole and a low stone wall that says “Laurel School”. There are reserved parking spaces for admissions visitors on the main entrance’s driveway, conveniently located by the front door. After you enter the building through the main double doors, the Admissions Office is located immediately to the right. Laurel families will gather to enjoy a light dinner and a chance to socialize. Class t-shirts will be distributed and a class photo will be taken. Kick off the summer with classmates new and old!